services bar none. 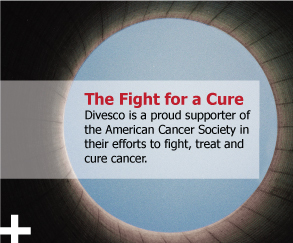 Divesco is a utility's CLEAR solution to meet even your routine supply needs. Our knowledge of where to find the parts your plant needs results in providing power to your customers. Divesco has expanded our abilities to meet your needs through their expertise in dedication and reverse-engineering of those hard-to-find or obsolete items. Divesco keeps a standing inventory of more than 13,000 previously qualified nuclear spares in our warehouse, ready to ship. If you need a part, call us or fax the specs, we'll do a quick inventory check and advise you immediately. Is your plant undergoing the process of reducing your current inventory levels? Whether owned and stored by your plant or by Divesco, let us help you safeguard your inventory for future availability. Divesco's Nuclear Quality Assurance program complies with the applicable criteria of 10CFR50 Appendix B and ANSI standard N45.2. We maintain traceability and proper documentation just like you do. Our headquarters and warehousing facilities are adjacent to the Jackson International Airport. Aircraft, dedicated trucks, and most importantly - PEOPLE - are on standby for your routine and emergency needs. Copyright 2008-2009 Divesco. All rights reserved.